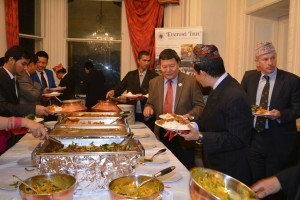 Colonel Brigade of Gurkhas, Colonel James Robinson, attended the party in the Nepalese Embassy in London on Monday 10th October 2016 and was accompanied by the Deputy Chief of Staff Brigade of Gurkhas, Major Surya Rai. 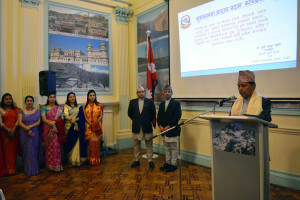 The party was hosted by the new Nepalese Ambassador, Dr Durga Bahadur Subedi who assumed his appointment last week. 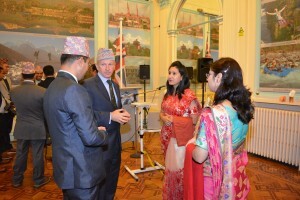 Colonel Robinson took the opportunity to thank the Ambassador for his kind invitation and conveyed him his Dashain greetings on behalf of the Brigade of Gurkhas. In addition, he informed the Ambassador of his intent to invite him to Headquarters Brigade of Gurkhas in Camberley for a visit. The Ambassador said that he was honoured to have been invited and that he would love to visit the Headquarters in due course. 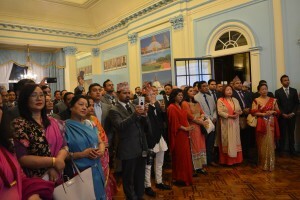 The function was attended by a huge number of dignitaries and people from all walks of life. Colonel Robinson also met Nepal’s Chief Secretary, Dr Som Lal Subedi and spent time in chatting to Gurkha veterans present on the occasion.